Let's analyze the word "Trigonometry". The prefix tri means 3 -- as in trimester, triangle or tricycle. The last part of the word nometry -- is a Latin term for numbering or measuring. So Trigonometry deals with the measures of 3 sided figures -- or triangles. This form of math was first used around 160 B.C. by Hipparchus, an ancient Greek fellow interested in astronomy and land measuring. We still use it today to measure distances on the ground for surveying, measuring the height of a building, and especially for navigation. Trigonometry defines three functions and their reciprocals based on the ratio of the lengths of specific sides of a right triangle. The ancients noticed that -- no matter how long or short the sides of any right triangle, the ratio of the lengths of the 3 sides, taken in pairs, remained constant, so they assigned specific names to the three ratios or functions -- sine, cosine, and tangent. Since they did, we've been using these functions to assist us in every known science -- because math is the language of science -- all forms of science -- chemistry, physics, biology -- are ruled by the natural mathematical relations which exist in our world and Trigonometry helps us understand them.Without trig, land surveyors, navigators and astronomers would be lost and frustrated. One final request before we get started. Please don't refer to the sine function as "sin" -- the word we hear in church. "Sin" is an abbreviation of sine, so it is pronounced "sign". Sin is for Philosophy and Religion courses. Sine is for math. we hit the x -1 or 1/x button and we've got it -- so why waste buttons for no good reason? Each trig function represents a RATIO of 2 sides in a right triangle. The sine, cosine, and tangent of an angle are CONSTANT. This means that sin 30º is always 0.5 regardless of the lengths of the sides of the triangle. Note: the side opposite the 90° angle is always called the hypotenuse. As we can see in the diagram, the sides opposite the angles are labeled with the same letters but in lower case. The side opposite angle A is labeled " a " etc. Definition: the angle of elevation to an object is measured from the horizontal upwards. Definition: the angle of depression to an object is measured from the horizontal downwards. When we solve a right triangle, we will be given 2 pieces of information and asked to find the remaining angles and sides. Since the acute angles of a right triangle are complementary, (they add to 90° ) , if we're given one of the acute angles, we can find the second by subtracting the first from 90°. The sides are found using trig functions. 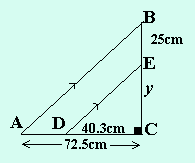 Solve the right triangle if angle A = 35° and b = 12 cm . 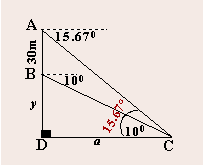 Angle C = 90° . When we're given the measures of 2 sides, we need to find the 3rd side and the 2 acute angles. We use the inverse trig functions shown as sin - 1, cos - 1, tan - 1 on our calculators to do this. (on most calculators they are "second" or "shift" functions. They're often found over the trig functions. The sine of an angle tells us the ratio of the opposite side to the hypotenuse. The inverse sine (arcsin or sin - 1 ) of a ratio tells us the ANGLE with sine equal to that ratio. We know from the 30° , 60° , 90° triangle that sin 30° = ½. So arcsin ½ = 30°. If the answers are to be given in degrees, make sure your calculator isn't set to radians in the MODE menu. Say we know that sin A = 0.7 and we need to find angle A . We enter sin - 1 0.7 and the calculator will display the measure of angle A. It is 44.43°. The function sin - 1 is also called arcsin. This is the best notation. See note below. The other inverse trig functions are arccos and arctan. Beware!!! In Algebra, x -1 means the reciprocal of x. In the notation for inverse trig functions, the -1 exponent does not mean reciprocal -- it indicates the inverse function. The reciprocal of the sine function is the cosecant function not the arcsin function. Because this causes confusion, it is best to always use arcsin, arccos, arctan, etc. to indicate an inverse trig function. With y = sin x, we plug in angle values for x and generate ratio values for y. When we have y = arcsin x, we substitute ratio values for x and generate angle values for y. We substitute an angle value for x in y = sin x; we get a ratio. We substitute a ratio value for x in y = arcsin x; we get an angle. So the statement y = sin x is identical to x = arcsin y since x is the angle whose sine = y.
something to represent the angle to which we apply the trig function. In the statement y = sin x, x is called the argument. In the statement y = sin 37° , 37° is the argument. So, don't write sin = 0.4571 and lose half a mark, write sin A = 0.4571 to get full credit. Form is extremely important in the language called math! Don't mess with it. It's been around longer than you -- so learn it, apply it -- and don't make a fuss. tan A = = 0.52518 therefore angle A = arctan (0.52518) = 27.71°. 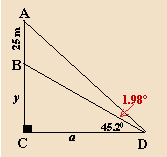 therefore angle B = 90 ° - 27.71° = 62.29° . 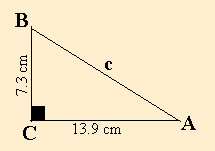 To find c , we could use the Pythagorean theorem but let's use a trig function. Now that we know angle A = 27.71° , we can use sin A to find c .
sin 27.71°= , so c = = 15.7 cm. 2) A rectangle is 26 cm by 14 cm. a) What angle does the diagonal make with the longer side? b) How long is the diagonal? 3) A 20m ladder is placed against a wall so that the foot of the ladder is 5m from the wall. a) What angle does the ladder make with the wall? b) How high up the wall does the ladder reach? 4) The lengths of the shadows of two vertical poles are 72.5 cm and 40.3 cm respectively. The first pole is 25 cm taller than the second pole. a) Find the angle of elevation of the sun. b) Find the length of each pole. 5) A lighthouse 25 m. high stands on the top of a cliff. From a point on the seashore, the angles of elevation to the top and bottom of the lighthouse are 47.2° and 45.22° respectively. Find the height of the cliff. 6) From the top of a building and from a window 30 m. below the top, the angles of depression to a car on the street are 15.67° and 10° respectively. a) What is the horizontal distance from the building to the car? b) What is the height of the building? the street is 37°. The angle of elevation to the top of the building is 51°. If the street is 25 m. wide, find the height of the building. 8) A particle with an acceleration of 1.9 m/sec2 makes an angle of 22.5° with the x-axis. Find the x and y components of the acceleration. angle A = 90° - 6.2° = 83.8°. b) d² = 26² + 14² so d = = 29.53 cm. We're looking for either angle D or angle A since they're both the angle of elevation of the sun. b) We've already found the shorter pole when we found y, so, the shorter pole is 31.29 cm tall and the longer pole is 31.29 + 25 = 56.29 cm. In this question, we have to solve for an unknown in 2 different ways and then equate the two expressions in order to solve for one of the missing parts. We find 2 expressions for a and equate them. so, since a = a, we set the 2 expressions equal to each other, then solve for y.
so, , so the cliff is 348.97 m high. 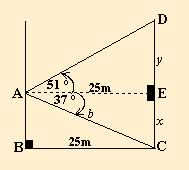 The answer for b) is the building is 50.77 + 30 = 80.77 m.
the sum of DE and EC (y + x) and AE = 25 m.
x + y = 30.87 m + 18.84 m = 49.71 m.